A philosophy graduate interested in theory, politics and art. Alias of Jelena Martinović. Through his practice, Rick Begneaud explores implied histories and emotional applications of found elements, abstract painting, and collage on paper or canvas. Traveling all around the world, Begneaud collects fabrics that have memories. Journeying back to the artist’s studio, these pieces of fabric become patterned memories of the local culture from where they originated. His latest body of work is currently on view at Woodward Gallery in a show titled Rick’s Fabrics. Layering a personal tone, the exhibition takes the viewer on a powerful, emotional journey through these abstracted collage works which encapsulate his lived experience. 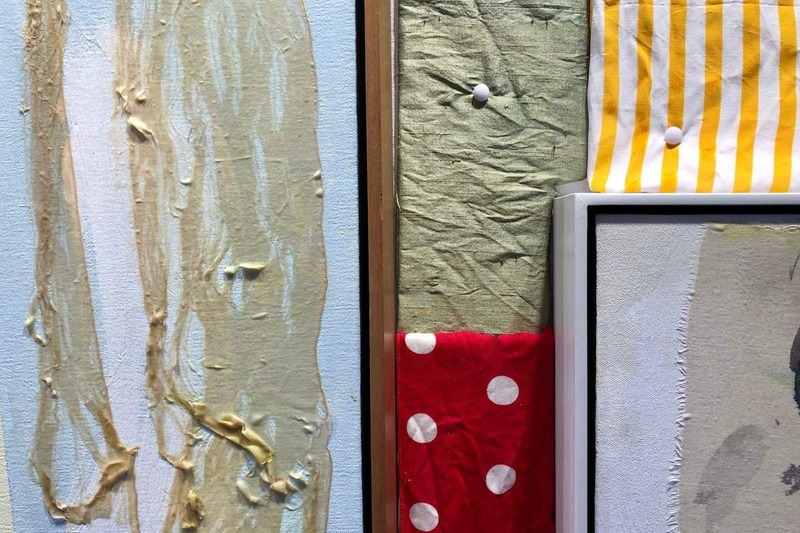 Although self-developed, the technique of Rick Begneaud was greatly influenced by the relationship between him and his uncle, Robert Rauschenberg. Spending many summers on the Captiva Island, surrounded by his uncle and his art friends, Begneaud soon wondered to his own artistic journey. As Rauschenberg’s studio assistant, the artist traveled extensively, developing his own practice along the way. The oeuvre of Rick Begneaud is born of place and experience. During his travels, the artist started collecting fabric scraps and blending them into his work. These found materials provide him with an intimacy that bonds him to an undiscovered place. Through a system of visual signs, the artist preserves the spirit and breathes new life into these found objects. However, the artist avoids assigning the role of a symbol to any given aspect of a piece, allowing that to the viewer himself. As he explains himself, an important part of his work is this abstract connection to others. While working with his uncle and mentor Robert Rauschenberg, Begneaud has developed his own technique which implements ideas of space and texture, color and lines. In the works on view at Woodward Gallery, geometric forms breathe comfortably with the texture and space left in between. While observing the flow of pattern, color, empty space that seem to appear spontaneously, the viewer is free to assign their own meaning. The one should simply surrender and allow these gestural abstract works to take them to the rare zen place for dwelling and enlighting. The exhibition Rick’s Fabrics will be on view at Woodward Gallery in New York until December 30th, 2018. The audience can see the exhibition 24/7 from the gallery’s street-level windows and digitally with a full catalog available on their website. Also, individual visitor appointments are available. Featured image: Rick Begneaud’s Fabrics, Courtesy Woodward Gallery. April 23, 2019 Deeply invested in. April 24, 2019 A philosophy graduate.